In the busyness and anxieties of the Christmas season it's easy to forget the big things, because our minds are being twisted in every direction at the growing mountain of little things. In the Word of God we read that it will be the little things that can cause the greatest damage to what we have. Today I'm looking at this through the eyes of my own life this past year - twelve months of the busiest work load I can remember, and I notice that all too often I allowed those 'little foxes' to accumulate over days,weeks, and even months, until they had taken the very feet out from under me. But the saddest evidence that I'd given the little foxes too much unbridled access to my mind was the slowing down of my morning devotional time with Jesus. For most of the last couple of years I'd open my eyes before dawn made it's appearance, and with expectant heart brew a fresh coffee, open my battered blue Bible, and even wider open my heart to what the Lord was waiting to share with me that day. Not once did He fail to reveal a previously un-pondered truth to my spirit, and never did He leave me waiting. But over the past few months I've woken each morning with a different heart. A heart of sadness, of concern, of obligation, of hurried-ness for work to begin and eventually for the day to be over. It snuck up on me, this growing distance between my heart and God's. He hadn't changed, but I had. The worries and concerns of life had overshadowed Truth. I saw what I lacked in this world, and not what was eternally waiting in the treasure vault of Heaven. Darkness stared back at me and I did not Light the candle of Christ to dispel it. When I finally cried out in the deep darkness of my night He responded with such gentleness, forgiveness, and grace, and HE lit the Light for me. 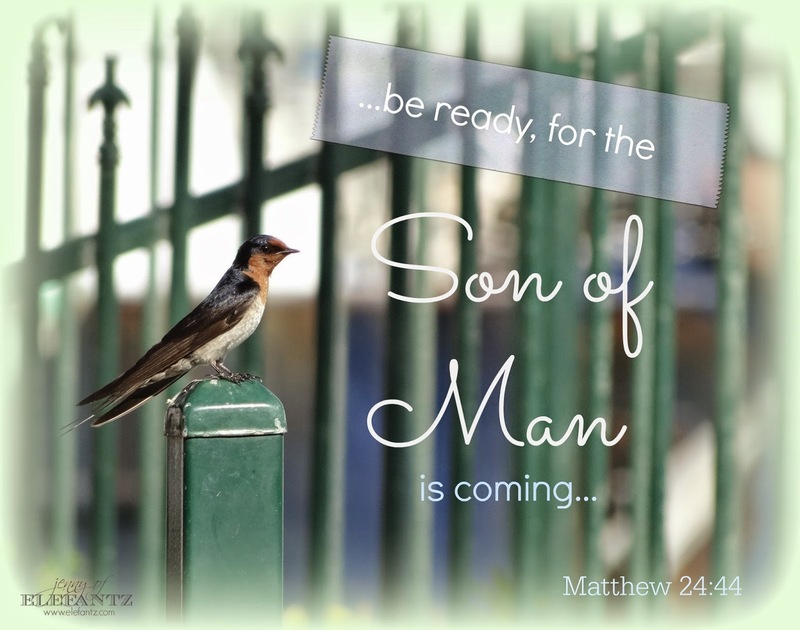 "....the Son of Man is coming at an hour when you do not expect Him." Take heart dear friend. He really is coming. Capture those little foxes in your life that have drawn your eyes and heart and time away from Jesus. They are not important, so let them go. Hold fast to what is ahead, sweet brother and sister in Christ. I'm praying for you today, please pray for me. What a wonderful, uplifting post Jenny. It's a good reminder to all of us. My prayers for you and yours. Have a Blessed Christmas!! Thank you Jenny. You never disappoint and your words today are truly inspiring. If one is willing to listen He will give you the direction. Thank you for sharing. Your testimony of faith in Jesus rings loud and clear. I also had to remove "busyness" from my life and put Jesus, my savior back in it. Thank you, Jenny, thank you!! Thank you Jenny, that is exactly what I needed. Those little foxes have been having a great time at my house also! God bless you! Thank you for this Jenny dear. Thank you Sweet Jenny. I needed this so much! Love you! Gracias por compartir la palabra del Señor, oramos por usted y su familia, Dios la ama y esta a cada instante con nosotros, cuando sentimos que las cosas se ven obscuras el Señor derramará bendiciones al doble, Dios la Bendiga. Great post...always enjoy what you have to say and exhibit. He IS good, isn't He!! Love your inspirational testimony and reminder to make our prayer life a priority. Hugs and prayers coming your way!! Il est la Lumière du monde, Il est fidèle, Il nous aime. Prayers and hugs, my friend! Like a whisper in my ear, your words have strengthened me. Struggling with grief issues this holiday, I feel closest to my Savior in the late night. That is when I read and ponder the day past and all the things I could do to make it better for those I have lost and those who still need me for so many things. The grief lays heavy on my heart but this Holiday is about the blessing of Christmas. Thank You. I could so relate to what you wrote about! Just yesterday, I was asking the Lord if He would like for me to just seek Him in His Word, and lay aside for a season all of the things that take away time from Him. They are the creative things that I love to do, but I love Him more. I think it might just be the right time for me to sit at Jesus' feet, as did our sister Mary, "who chose the better part." Thank you for the reminder of His coming! Come quickly, Lord Jesus!